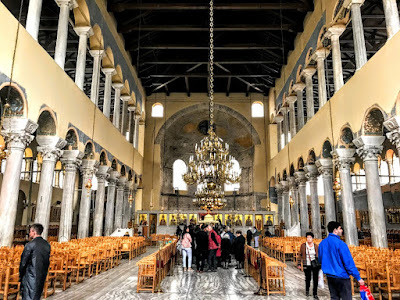 Throughout this Easter weekend in Thessaloniki, I have been visiting a number of churches throughout the city each day. The Church of the Panagia Acheiropoietos (Παναγία Ἀχειροποίητος) is a fifth-century Byzantine church in the city centre, at Aghias Sofias Street, opposite Makedonomachon square, a short distance to the north of Egnatia Street. 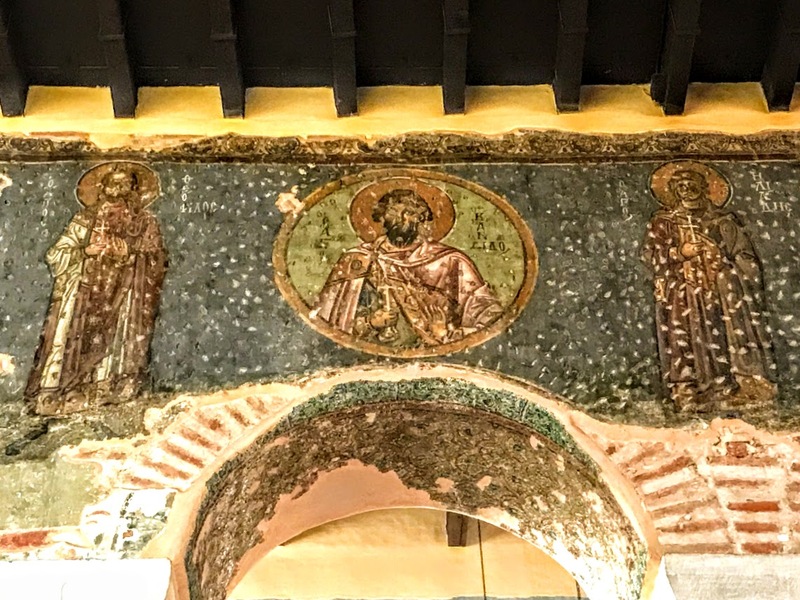 This church can be dated from its bricks and mosaics to the two decades between 450 and 470, making it one of the earliest of the surviving churches in Thessaloniki. It was built on the remains of a Roman bath, and was modified in the seventh century and again in the 14th and 15th centuries. In Byzantine times, the church was known as the Panagia Theotokos (the Virgin Mary, Mother of God). The present name is first recorded in 1320, and recalls the presence in the church of a miraculous icon of the Virgin Mary with the Christ Child and known as acheiropoietos (‘not made by hands’). The icon was believed to be made by divine, not human hands. Byzantine sources record that the city’s patron, Saint Demetrios, was also venerated in this church. This church is a three-aisled basilica, 28 metres wide and 36.5 metres long, with a wooden roof. Its eastern end is a semi-circular vault, while the western side has a narthex, flanked by towers, and traces of an exonarthex survive. The three aisles are separated by columns, while the two side aisles have galleries above them. At the east end of the north side aisle, there is a chapel from the middle Byzantine period dedicated to Saint Irene. On the north-west corner, the stairway leads to the galleries survives. 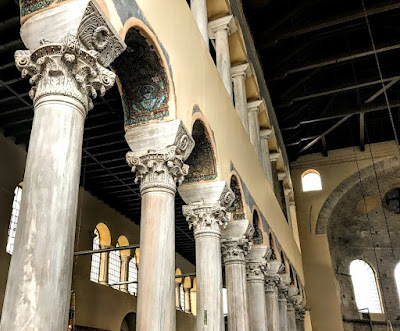 The present entrance to the church is through a triple-arched opening that connects the narthex with the main nave, while on the south side there is a monumental entrance that probably connected the church with the city’s Byzantine-era thoroughfare. Another small adjoining building on the south side has been identified as the church’s baptistery or a diaconicon The modern roof of the church is lower than the original roof, where the section above the central nave was elevated to allow light in. The surviving parts of the church’s rich original interior decoration include particularly fine fifth-century capitals from a workshop in Constantinople, the columns made of green marble from Thessaly in the triple-arched opening, the original Proconnesian marble pavement in the central nave, and fragments of decorative fifth-century mosaics. The elaborate traditional ‘acanthus’ – leaf decorations that Byzantines loved so much – can be seen on the marble columns. The high quality mosaics in the colonnades, gallery, narthex and at west wall depict crosses, water vessels, birds, fruit, fish and other religious themes. The sponsor of the mosaics is named to as Andrew, and he has been identified as the priest who attended the Council of Chalcedon (451) as the representative of the Archbishop of Thessaloniki. All that survives from the Byzantine-era murals are a few poorly preserved examples in the south nave, on the wall above the south colonnade. The 18 figures, who are shown alternately in profile and in full face, were part of a depiction of the Forty Martyrs of Sebaste, and date from the first quarter of the 13th century (1200-1225). Underneath the pavement in the north aisle, three layers of floor mosaics from an earlier Roman-era bath have been uncovered. After the Ottoman conquest of Thessaloniki in 1430, the Church of the Panagia Acheiropoietos was the first church to be converted into a mosque, by Sultan Murad II. An inscription by Murad survives in the northern colonnade, on the eighth column from the east: ‘Sultan Murat Conquered Thessaloniki in 833’ (1430). 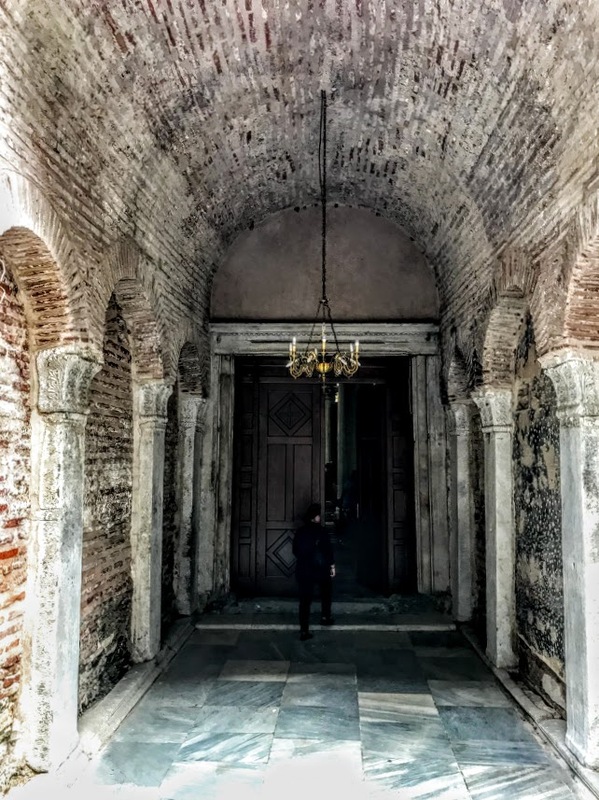 Throughout the Ottoman period, this remained the principal mosque in the city and it was known as the Eski Camii or ‘Old Mosque.’ During that time, practically all the figurative decorations of the church, including the mosaics and frescoes, were hacked away. The building became a church once again in 1930, and it remains a beautiful example of Byzantine architecture. Excavations were carried out in 1927-1928, in 1946-1947 in the precinct of the church and in 1961, in the area to the west of the church. Further restoration work was carried out after the earthquake that devastated Thessaloniki in 1978, and several trenches were opened inside the church and in the courtyard. Thanks to the robustness and external grandeur of the basilica, the harmony and balance of its internal layout, the high artistic merit of its mosaic and the sculptural decoration and its marble floor, this church is considered one of the most important examples of its kind throughout Greece.